Above are two sets of data that were gathered by school children in 1986 for what was called the Domesday Project. This project took place throughout the U.K. celebrating $900$ years since the Domesday Book. You can find out more about it here. 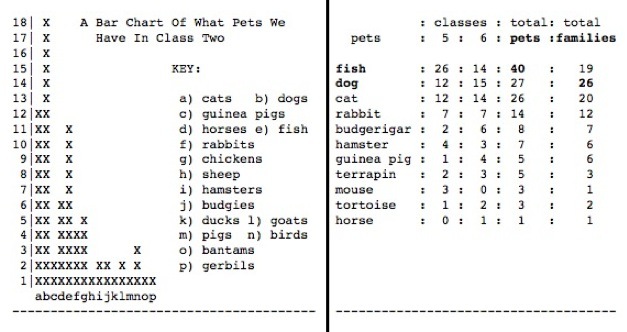 So, in the data you see what two schools found out about the pets owned by some of the children. The Domesday Project took place in the early days of computers and so there were not many ways to display the information. Here is a collection of seven such surveys which you can download as a pdf (data.pdf). These seven include the two above. Have a good look at them. You could focus on just the two above or on all seven. What did the various school children find out? These seven schools were all from very different areas of the UK. Does that surprise you? How might that have affected the data? What differences do you notice in the ways that the data is displayed? Which survey do you think is presented in the best way? Why? Which survey do you think is not presented in a helpful way? Why? You could do a similar survey in your class and compare the results. Interpreting data. Addition & subtraction. Working systematically. Combinations. Practical Activity. Investigations. Processing and representing data. Area - squares and rectangles. Handling data. Describing Sequences.